King Kheik Ta Thin, the nephew of king Su La San Dra, founded Pyinsa after fall of Vesali. In those days, Arahat Thit Sa Van Da Wa practised meditation in the cave near the city of Pyinsa during three months of lent. That cave still can be seen unitl now. The cave is called Ngetkhaung. 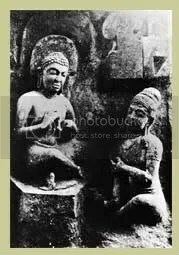 That Arahat Thit Sa Van Da Wa practised meditation in the cave at the base of Lamaded mountain as well. Lastly, he practised meditation dwelling in Thamoatdawiri of present Sittwe. The word “Bandawagu” gradually became changed to Bandawgu, and in finally, Badawmaw at the present time. Those names are called regarding Arahat Thit Sa Van Da Wa. He attained Parinibbanna in Thiripatpada mountain of Sanga mountain ranges. King Kheik Ta Thin cremated the cropse by himself. He built a pagoda on Thiripatpada mountain enshrining relics of Thit Sa Van Da Wa and others in AD 818. The pagoda is octagonal in shape at the base and it is surrounded by eight spherical pagodas which face eight directions. The pagoda is called Koenawon because it has nine pagodas in total. The Buddha image in the form of Pacinka mudra, is in the cave monastery of the east. The Buddha image in the form of Oattarabawdi mudra is in the cave monastery of the south. The Buddha image in the form of Latkhanadipa mudra is in the cave monastery of the south-west corner in which Buddha image is pointing to his sole with his right hand’s index finger. The Buddha image in the form of gaining Parinibbanna, is in the cave monastery of the west. The Buddha image in the form of preaching Dhamma to Yatkhas, is in the cave monastery of the north-west corner. That mudra is called Yatkhadamma mudra. The Buddha image in the form of Abaya mudra is in the cave monastery of the north-east corner. It is necessary to repair the surrounding pagodas because they are ruins. And, king Kheik Ta Thin built Mingalardatshwegu pagoda in the western hill of Koenawon pagoda enshrining the relics of Arahat Thi Sa Van Da Wa and Buddha relics in AD 818. The pagoda is bell-shaped in structure. The base of the pagoda is octagonal in shape and the stone sculptures are at the corners of the pagoda. The entrance cave is in the east. The stone Buddha image in the perfumed chamber, is five feet high. The pagoda is maintained by the board of trustee of the pagoda.